FRANK BAJAK (AP), JESUS DE MACHACA, Bolivia — In Ecuador, the Shuar are blocking highways to defend their hunting grounds. In Chile, the Mapuche are occupying ranches to pressure for land, schools and clinics. In Bolivia, a new constitution gives the country's 36 indigenous peoples the right to self-rule. But much is born of necessity: Latin American nations are embarking on an unprecedented resource hunt, moving in on land that Indians consider their own — and whose pristine character is key to their survival. "The Indian movement has arisen because the government doesn't respect our territories, our resources, our Amazon," says Romulo Acachu, president of the Shuar people, flanked by warriors carrying wooden spears and with black warpaint smeared on their faces. A month ago, the Shuar put up barbed-wire roadblocks on highway bridges in Ecuador's southeastern jungles to protest legislation that would allow mines on Indian lands without their prior consent, and put water under state control. On Sept. 30, an Indian schoolteacher was killed in a battle with riot police. "If there are 1,000 dead they will be good deaths," says another Shuar leader, Rafael Pandam. The Shuar won, at least this round. A week after the killing, President Rafael Correa received about 100 Indian leaders at the presidential palace and agreed to reconsider the laws. Correa had earlier called the Indians "infantile" for their insistence on being consulted over mining concessions. But he didn't need to be reminded that natives — a third of the population — have become an indispensible constituent and helped topple an Ecuadorean government in 2000. Indians make up one in 10 of Latin America's half-billion inhabitants. In some parts of the Andes and Guatemala, they are far more numerous. Yet they remain much poorer and less educated than the general population. About 80 percent live on less than $2 a day — a poverty rate double that of the general population, according to the World Bank — while some 40 percent lack access to health care. The threats to Indian land have grown in recent years. With shrinking global oil reserves and growing demands for minerals and timber, oil and mining concerns are joining loggers in encroaching on traditional Indian lands. "Indians have been progressively losing control and ownership of natural resources on their lands," says Rodolfo Stavenhagen, a prominent Mexican sociologist who spent most of the past decade as the U.N.'s chief advocate for Indians. "The situation isn't very encouraging." Hence the revolt rippling up and down the Andes. In Peru, south of the Shuar's lands, the government has divided more than 70 percent of the Amazon into oil exploration blocks and has begun selling concessions. Fearing contamination of their hunting and fishing grounds, Indians last year began mounting sporadic road and river blockades. On June 5, riot police opened fire on Indians at a road blockade outside the town of Bagua, where jungle meets Andean foothills. At least 33 people were killed, most of them police. The Indians were unapologetic for resisting. "Almost everything we have comes from the jungle," says one of the protesters, a wiry elementary school teacher from the Awajun tribe named Gabriel Apikai. "The leaves, and wood and vines with which we build our homes. The water from the streams. The animals we eat. That is why we are so worried." Farther south along the world's longest mountain chain, Chilean police are protecting 34 ranches and logging compounds that Mapuche Indians have targeted for occupations or sabotage. The Mapuche, who dominated Chile before the Spanish conquest, now account for less than 10 percent of its people and hold some 5 percent of its land — among the least fertile. Mapuche activists agitating for title to more lands and greater access to education and health care stepped up civil disobedience this year. In August, riot police mounting an eviction killed one Mapuche, and eight were injured. "If the government and the political class doesn't listen to our demands the situation will get a lot more difficult," Mapuche leader Jose Santos Millao tells the AP in Santiago. He rejects as a "smoke screen" President Michelle Bachelet's creation of an Indian Affairs Ministry in September. Nowhere is Indian power so evident as Bolivia, which elected its first indigenous president, Evo Morales, in December 2005. Morales dissolved the Ministry of Indigenous Affairs and Original Peoples, calling it racist in a country where more than three in five people are aboriginals. In February, voters approved a constitution that creates a "plurinational" state and accords Bolivia's natives sovereign status. Time-worn models of aboriginal government, community justice and even traditional healing are now legally on equal footing with modern law and science. In the capital of La Paz, "cholitas" — Indian women in traditional bowler hats and embroidered shawls — now regularly anchor TV newscasts. "Miss Cholita" beauty pageants are in vogue and native hip-hop stars headline at nightclubs. At the presidential palace, Morales — a former Aymara coca farmer who knew hunger as a child — makes a point of lunching periodically with the lowliest of palace guards. Morales is ensuring that profits from natural gas and mineral extraction are distributed equitably and that water — whose privatization in the city of Cochabamba spurred an uprising in 2000 — is never again privatized. He's also pushing to make electrical utilities public. Morales has founded three indigenous universities, formalized quotas for Indians in the military and created a special school for aspiring diplomats with native backgrounds. And he is promoting a campaign to demand that all public servants be fluent in at least one native tongue. "There is no way to return to the past," says Waskar Ari, an Aymara who changed his name to Juan in the 1970s so he would be accepted to a private high school in La Paz. Now a University of Nebraska professor, Ari likens his country's "rebirth" to the casting off of apartheid on another continent two decades ago. "Finally," he says proudly, "Bolivia is no longer the South Africa of Latin America." The legal groundwork for the empowerment drive by Latin America's Indians was crowned by a September 2007 U.N. Declaration on the Rights of Indigenous Peoples. Though nonbinding, it endorses native peoples' right to their own institutions and traditional lands. It has been almost universally embraced by Latin American governments. It has also helped Indians win some major legal victories. _In 2007, the Supreme Court of Belize ruled in favor of Mayan communities that challenged the government's right to lease their lands to logging interests. _A similar ruling by the Inter-American Court of Human Rights on behalf of the forest-dwelling Saramaka maroons in Suriname reinforced that indigenous groups must give consent to major development projects. _Last December, Nicaragua's government finally granted collective land titles to the Mayagna people, complying with a landmark 2001 ruling by the Inter-American Court of Human Rights that it had no right to sell logging concessions on Indian land. _The following month, Colombia's Constitutional Court deemed more than 1 million indigenous people "in danger of cultural and physical extermination" and told the government to protect them. _And in May, Brazil's Supreme Court ordered rice farmers to leave the long-disputed Raposa Serra do Sol reservation — 4.2 million acres (1.7 million hectares) inhabited by 18,000 Indians in the Amazon's northernmost reaches. Despite the legal rulings, Indians remain second-class citizens. Only one indigenous representative has ever been elected to the national congress in Brazil, according to the government office that oversees issues related to Indians, who occupy vast areas of the Amazon though they account for less than 5 percent of the population. In Guatemala, where nearly half the population is of Mayan descent, not a single Indian has ever made it to national office. Educational disadvantages perpetuate the inequity. In Guatemala, three in four indigenous people are illiterate, the U.N. says. In Mexico, where 6 percent of the population is illiterate, 22 percent of adult Indians are. Even in Bolivia, only 55 percent of indigenous children finish primary school, compared to 81 percent of other kids. Efforts to "decolonize" remain fragile. In eastern Bolivia — where the United Nations says several thousand Guarani Indians, including children, work as virtual slaves on large estates — Morales has promised autonomy. But the area's elite, Morales' fiercest opponents, won't let that happen without a fight. Obtaining autonomy should be less contentious for Indians in western highlands towns like Jesus de Machaca, in part because the land in question yields so little. Jesus de Machaca is a hardscrabble farming town near Lake Titicaca that is more than 96 percent Aymara Indian. It is among 12 Bolivian municipalities, mostly Aymara and Quechua, whose inhabitants will vote Dec. 6 on becoming autonomous. Under self-rule, they would legalize governing practices that precede the Inca empire. Local leaders called mallkus are democratically elected by their communities in public votes, then choose senior town officials. Terms in office are restricted to a year. The system is closer to socialism than capitalism. Deputy mayor Braulio Cusi says autonomy will hugely benefit a community where nearly all the 13,700 residents live in adobe brick homes and use cow manure as cooking fuel, where most homes lack running water and babies are born at home because there's no hospital or clinic. "Dairy cooperatives, cheese processing. There will be jobs," says Cusi, who slings a white leather whip over his poncho as a symbol of authority. He envisions a slaughterhouse, and hopes to attract a veterinarian. The town's more than 900 square kilometers (350 square miles) are devoted mostly to cattle, llamas and sheep grazing, potatoes and quinoa. Purchased in the 16th and 17th century by natives who refused to become tenant farmers, they are communally owned but parceled out. Selling to outsiders is prohibited. Jesus de Machaca took its first step toward autonomy when it became an independent municipality in 2002. It later elected its first mayor, also a mallku. The national government more than doubled the town's budget. More than 70 percent of homes now have electricity — up from one in ten in 2001 — and construction just ended on a three-story municipal building with parquet floors and oak doors. The town is even building a soccer stadium — with astroturf, one councilman proudly notes. 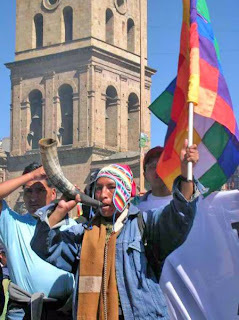 "Before, we were forgotten," Cusi says after watching the Wiphala banner of the Andes' indigenous peoples raised up a flagpole in the shadow of an imposing Spanish colonial church. "Now we're going to define, in our way, how we live — according to our own customs and practices." Associated Press writers contributing to this report included Mark Stevenson in Mexico City; Eva Vergara in Santiago, Chile; Jeanneth Valdivieso in Macas, Ecuador; Carlos Valdez in La Paz, Bolivia; Juan Carlos Llorca in Guatemala City; Ian James in Caracas, Venezuela; and Bradley Brooks in Rio de Janeiro.